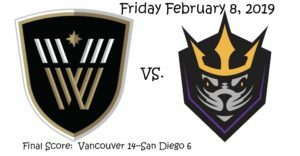 On Friday February 8, the Vancouver Warriors (3-6) took their first trip to the Pechanga Arena to match up against the Seals (4-3) for the second time this season. San Diego was able to win the first match up in Vancouver 11-10 but the Warriors were able to ruin the Seals perfect 2-0 record at home. The Seals came out hot only needing nine seconds to get one past Warriors goaltender Eric Penney (1A). It appeared that the week off was not going to affect the Seals dynamic offense. After a close first quarter, 3-2 in favor of the Seals the Warriors would control the rest of the game outscoring the Seals 12-3 in the remaining three quarters. The Seals started with Frank Scigliano between the pipes but after 12 goals they decided to swap him out for Tyler Carlson who played the last seven minutes. The Seals struggled with penalties and the Warriors were able to capitalize scoring five power play goals. Final score: Vancouver 14—San Diego 6. After winning the first draw Cameron Holding (1G) ran down and got the first shot of the night through the legs of Penney giving the Seals an early lead. The Seals would score again, this time coming from Dan Dawson (2G). Dawson took advantage of a confused Warriors defense as he walked in for an easy shot that bounced off the far post and in the back of the net. James Rahe (1G, 1A) would score the first goal for Vancouver getting an outside shot to go after coming around a high pick. The Seals left handed shooters got a lot of movement on their side forcing defensive help from across the floor which left Jules Heningburg (1G) wide open for an outside shot giving him his first ever NLL goal. San Diego forward, Jean-Luc Chetner (1G, 2A) would score five hole with an outside shot cutting the lead to just one. At the end of the first quarter San Diego held the lead, 3-2. The Warriors did some damage in the second quarter. Between Penney and the Warriors defense they limited the Seals to just one goal. The Warriors scored five unanswered goals in the second. The first coming off a power play opportunity, as Jordan McBride (2G, 2A) took an outside shot that bounced off Scigliano and McBride followed his shot getting his own rebound and scored with a spinning behind the back shot. A goalie interference major from Heningburg gave the Warriors a five-minute power play. Keegan Bal (6G, 4A) would score four unanswered goals for Vancouver, and twice during the power play, the first from an outside shot coming across the top; and the second when he picked up a loose ball after a shot and took the shot from the hockey face off dots putting it past Scigliano; and two more giving him four in a row, showing he can score five on five as he threw in a fake shot that stunned the defense giving him enough time to get the shot off. He would score his fourth shorthanded coming from behind the net and after getting a step on his defender was able to put a bounce shot far side. Garrett Billings (1G, 2A) was finally able to stop the bleeding for the Seals as he took advantage of being up two men on the power play. Warriors led 7-4 at the end of the half. Both defenses played strong in the third quarter only allowing a total of three goals. Dawson would the long goal for San Diego far side after he face dodged his defender and shot overtop of the defender that came for help. After ten minutes of scoreless lacrosse, Warriors Mitch Jones (2G, 4A) ended the drought by beating his defender with a swim move and dove towards the net jamming the ball in the top right corner. Jones attempted to dunk the ball from behind the net but lost the ball, and it flew right into the stick of Bal who, make no mistake gets his fifth of the night. At the end of the third quarter the Warriors continued to hold the lead 9-5. Vancouver continued to add to their lead by scoring another five unanswered goals in the final quarter. Tony Malcom (2G,2A) would get back to back goals, the first coming off a power play after catching a rebound right on the crease; and the other, right in front of the crease after he torched his player on the goal line and help did not come giving him all the time he needed to get his second. Jones chased out Seals net-minder Scigliano as he scored with an outside shot that found the back of the net. McBride would be the first to score on Carlson after receiving a backhand pass from Bal. But the change in net did not help. After a fast break Bal was able to get his sixth of the night giving him the sock-trick with a diving goal in transition. Austin Staats (1G, 1A) had a rough night for San Diego but was finally able to get one to go. Staats had a total of 15 shots with only eight of those hitting the net; a total of eight penalty minutes, it was clearly a tough night for the rookie. With 45 seconds remaining in the game San Diego was hit with a ‘too many men’ call resulting in a penalty shot for Vancouver. Bal was the obvious Warriors choice but failed to score. Final score: Vancouver 14—San Diego 6. San Diego (4-3) will look to bounce back in Toronto against the Rock (6-1) for the battle of the First’s on Friday February 15, game time 7:30 p.m. EST. Vancouver (3-6) makes the trip to Saskatchewan to face the Rush (3-3) on Saturday February 16, game time 10:00 p.m. EST.